The Vi Peel contains a synergistic blend of powerful ingredients suitable for all skin types, for dramatic results with virtually no pain, no skin preparation and little downtime. The treatment takes only 20 minutes or less! Healing time is in about a week. Microdermabrasion is the most natural way to gently and safely exfoliate the skin without chemicals and is one of the most requested non-invasive cosmetic procedures. Now you can minimize wrinkles, scars, sun damage, pigmentation problems, uneven skin tones and active acne without pain. With a series of Mega Peel customized microdermabrasion treatments, you can achieve move beautiful skin without pain and irritation. These treatments will effectively help to reduce the depth of surface lines, smooth out rough skin texture, help fade brown spots and assist in clearing acne/blemished skin. 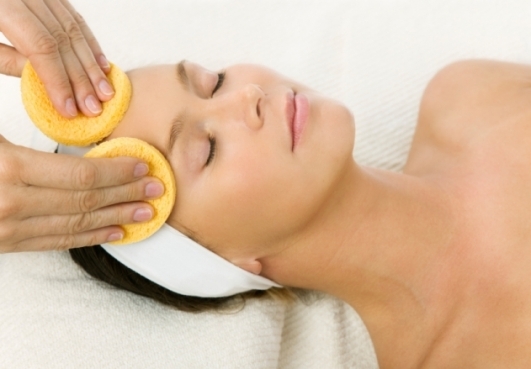 The naturally-occurring AHA’s (fruit acids) in these treatments will loosen the dead cells from the skin’s surface. This allows the healthier skin cells to come through, giving a smoother texture to your skin and a glowing, radiant appearance. Suited for individual skin types, it includes: removing make-up, analyzing skin, exfoliating with enzyme mask, steam and massage, extracting impurities, applying a mask suited to skin type, normalizing the texture. Hand and arm massage. Various essential oils to benefit and improve skin texture. Hand massage. Helps prevent and clear acne blemishes, draws out pore clogging debris, soaks up excess oils, calms inflammation and promotes fast healing of existing break outs. Alpha and beta-hydroxy acid blend of glycolic acid and natural fruit acids derived from blueberry, sugar cane, sugar maple, orange and lemon in light gel base. This treatment will help reduce fine lines, lighten pigmental spots, clear congested pores, smooth and soften skin texture and minimize the appearance of enlarged pores. Complete aroma-therapy facial for men. Essential for a smooth, clear back. Includes enzyme therapy, exfoliation mask, steam and massage. This antioxidant treatment is ideal for those skin types that have elastin loss and dehydration. Reduce fine lines, stimulate collagen production and renew skin firmness.